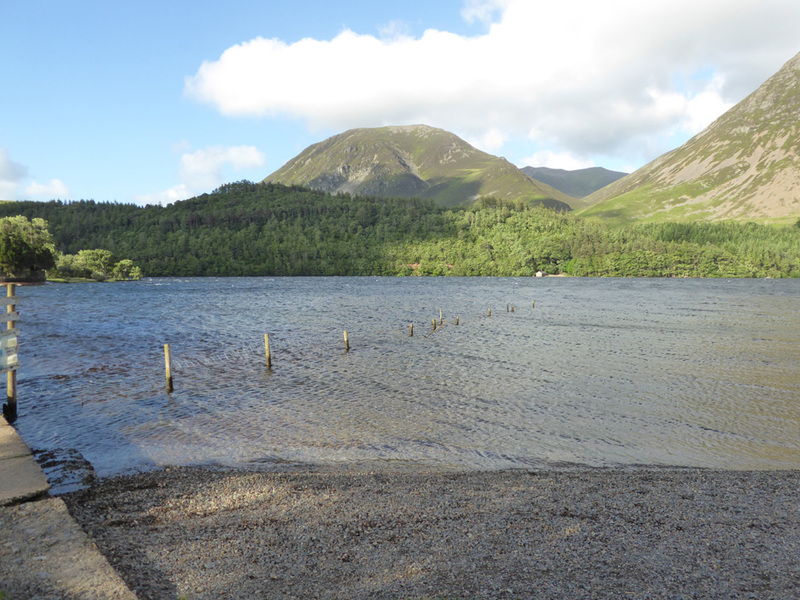 " A busy June 10th Weekend "
Places visited : Loweswater, Crummock and Sheffield. Walk details : Local lake walk for an hour or so. High point : Our daughter buying her own house. With : Melissa, Nesta, Ann and our dogs, Harry and Dylan. Weather : Fine but breezy. A busy weekend as a number of events came together. Jenna has received the keys to her new house in Sheffield and Cathy, Alexander and Jen's friends have spent a busy week decorating. 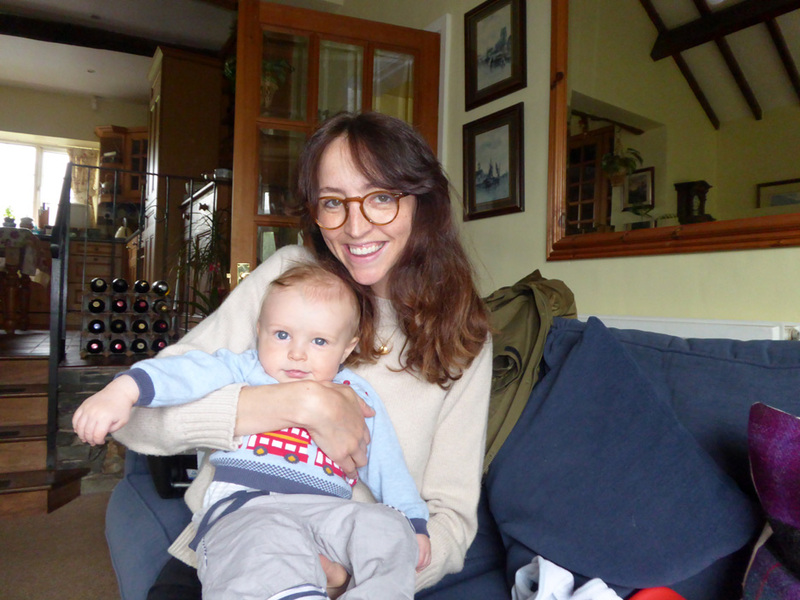 We had a surprise visitors on Saturday morning, Melissa, Roger's niece and her baby son Nesta. They were visiting from London. 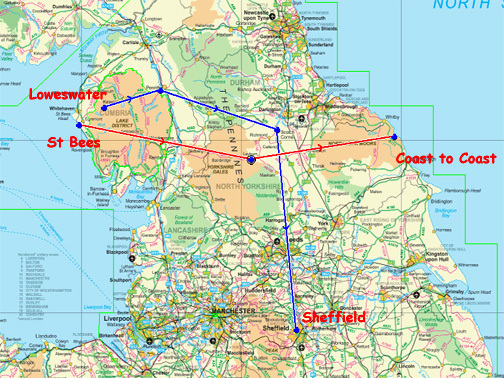 Melissa was part of the support team for her husband Tom who was doing a C2C (Coast to Coast) cycle event. 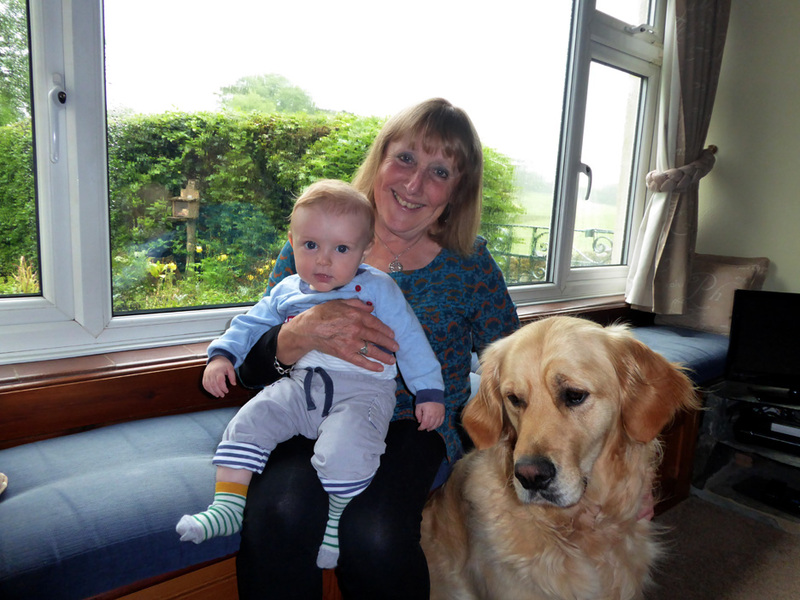 Tea and scones, a good catch up . . .
. . . and a chance for me to have a lovely cuddle. Someone furry was unimpressed with his mum paying lots of attention to someone else instead of him ! Melissa couldn't join us as she had to leave to meet the team at the Wheatsheaf for lunch. 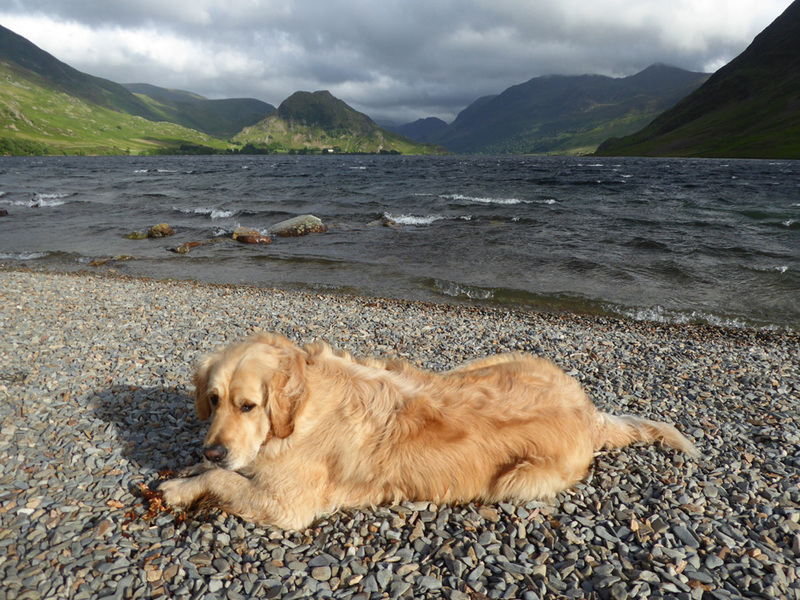 Fortunately for us the sun came out for our walk after a rather overcast morning. 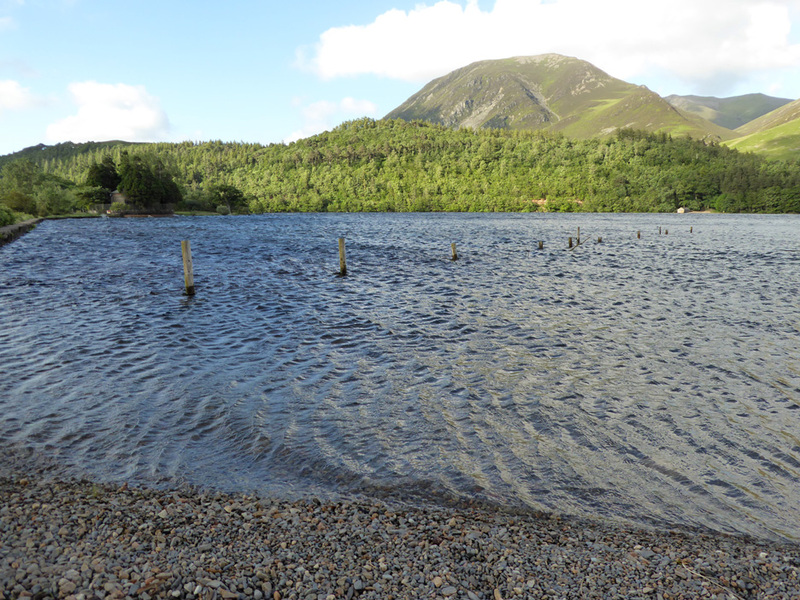 The water in the lake is well up again after a week of changeable and often wet weather. 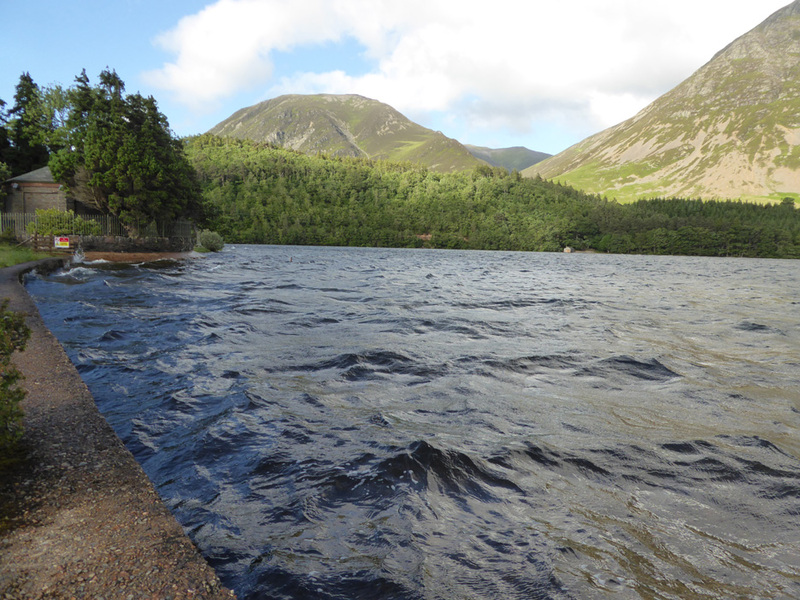 The wind was blowing well and there were waves breaking alongside the pump house. Dylan finds something of interest under the water at the small beach. 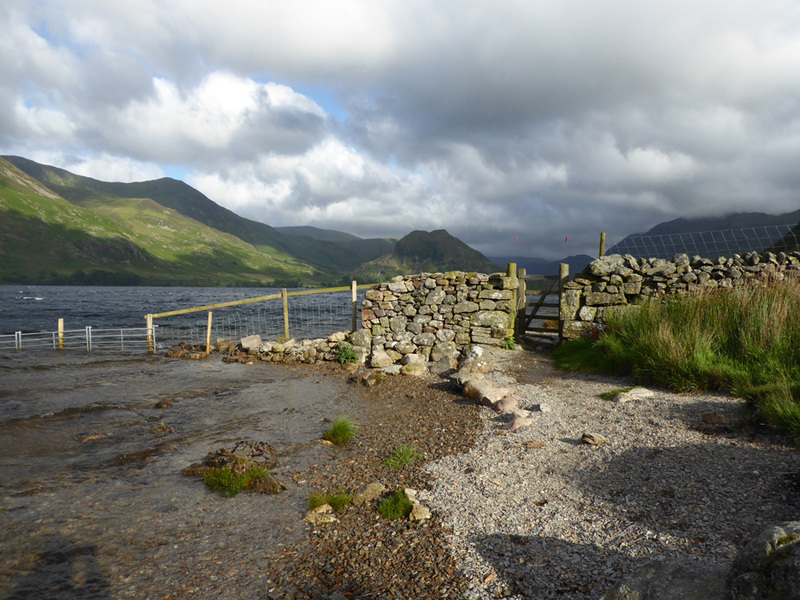 Views across Crummock to the boathouse with Whiteside and Hopegill Head as a backdrop. 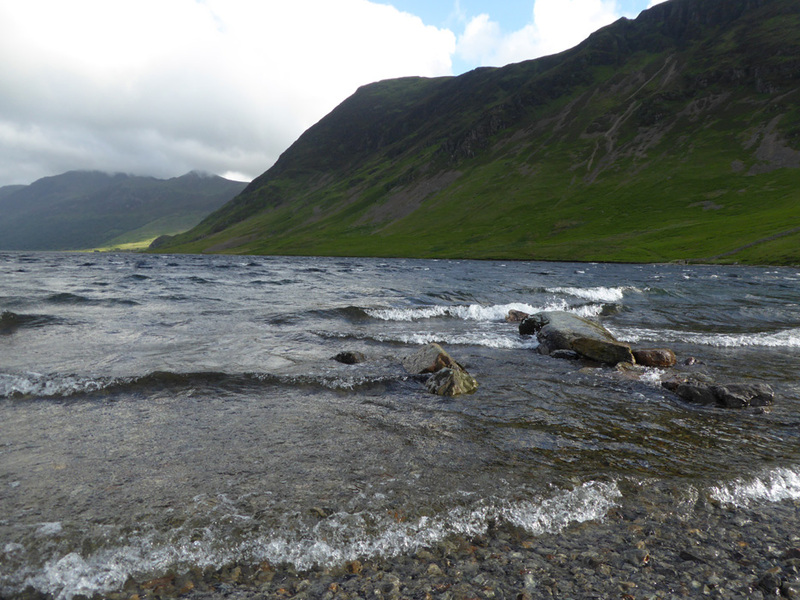 Heavily rippled water as the wind continues to blow strongly. More waves as we round the corner to the larger of the beach on this side. It's local name is Sandy Yat . . . but there's not a lot of sand. Last week that stone was well clear of water. 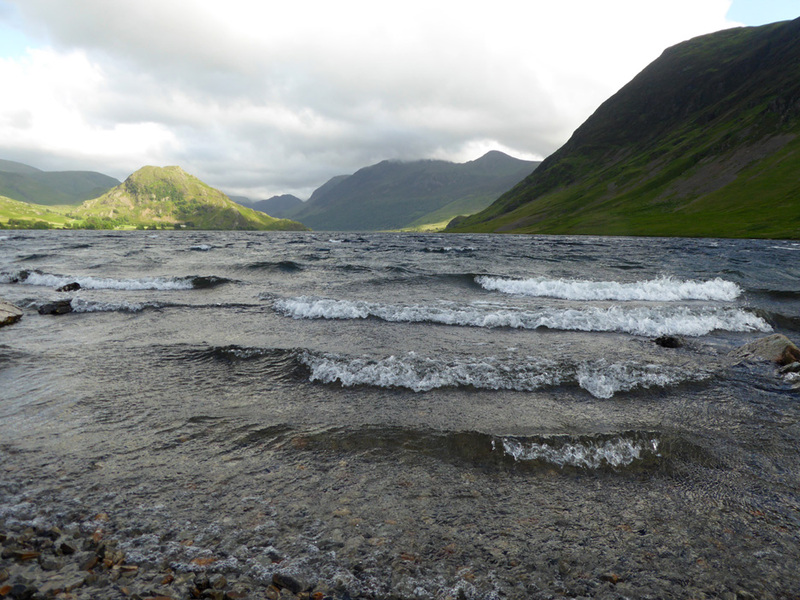 No reflections today as steady waves rush to the shore. but Dylan is having no such problems as he has his own patch of sunshine down here at the lake. 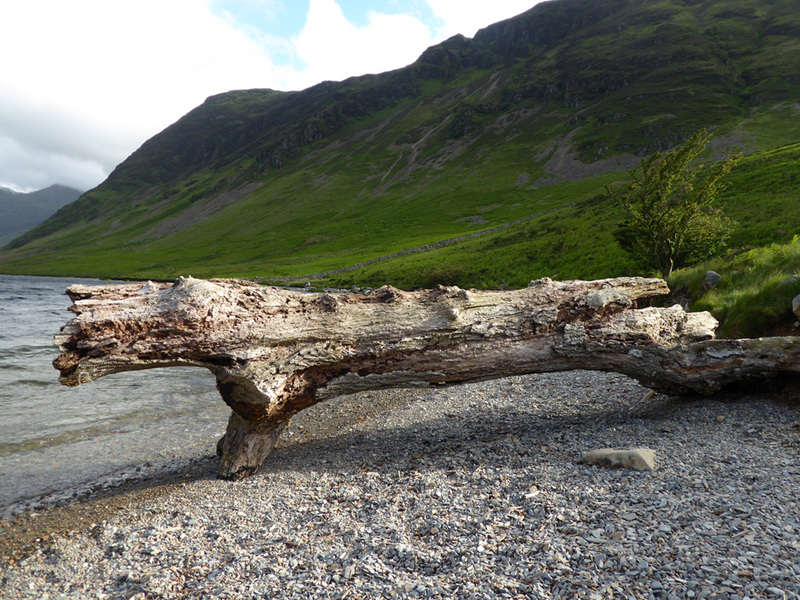 This fallen tree trunk has been affected by wind and rain over the years but still survives. 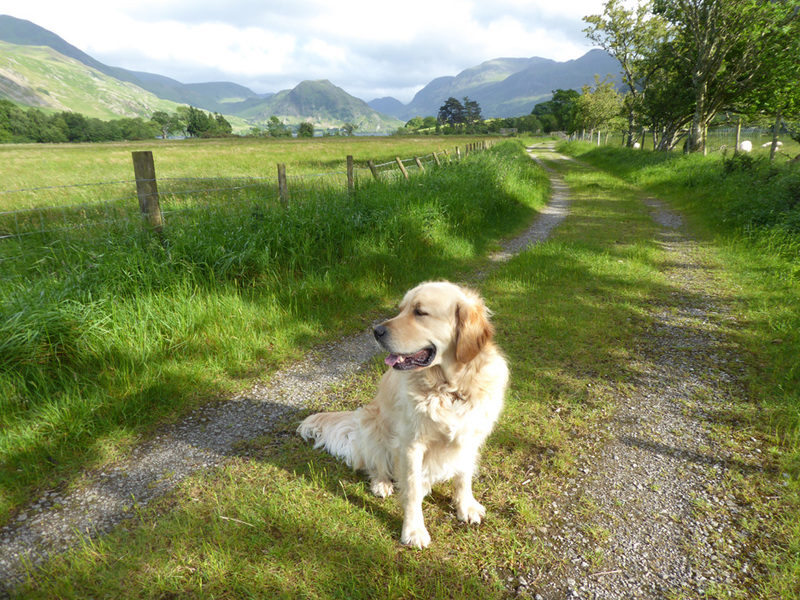 Dylan and I walk to the gate that leads on towards High and Low Ling Crags. 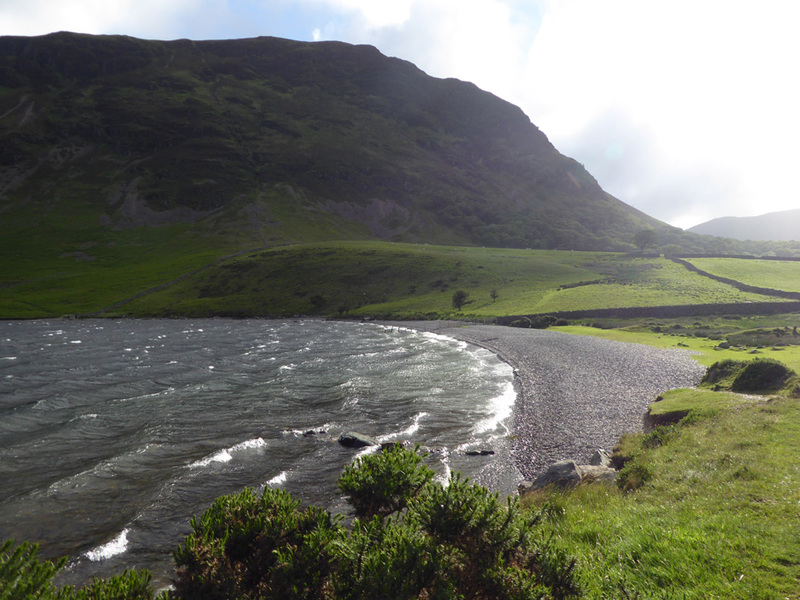 Rannerdale Knotts is back in the sunshine. 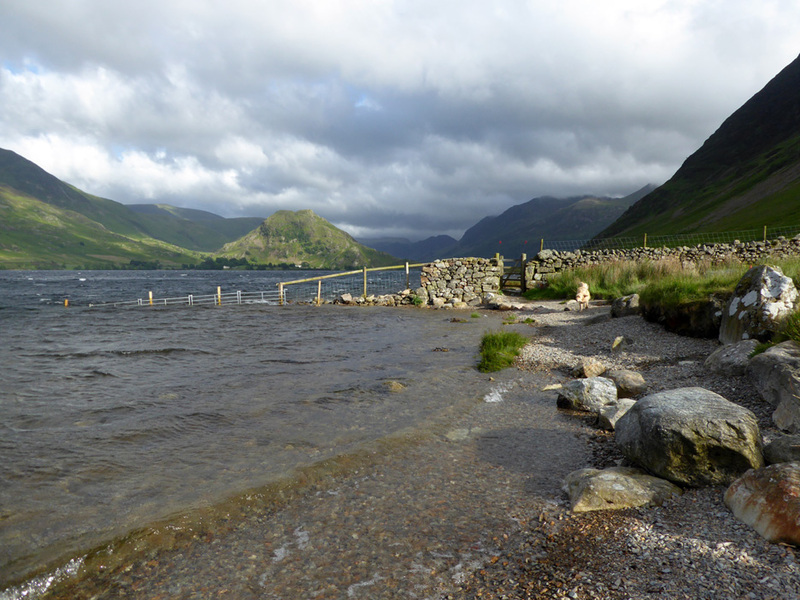 Within seconds the clouds change and Rannerdale retreats in to shadow. but as the infection he suffered seems to have aggravated his arthritic joints, it seems likely that he will not be able to walk very far any more. but he will see his time out loved, cosseted and resting with just little walks from home. 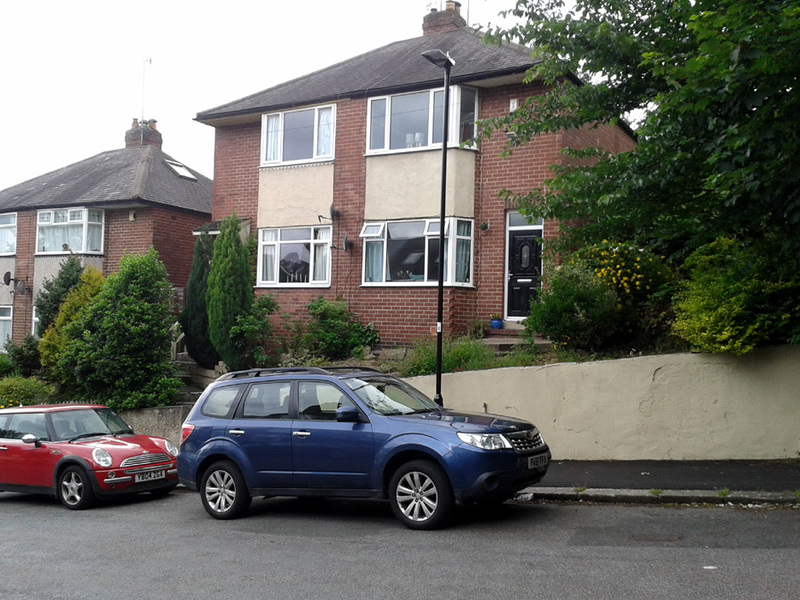 Whilst Ann was looking after the boys, I was in Sheffield . . . helping Jenna move in to her new house. She and her sister seem to have written a long list of things for me to do . . . 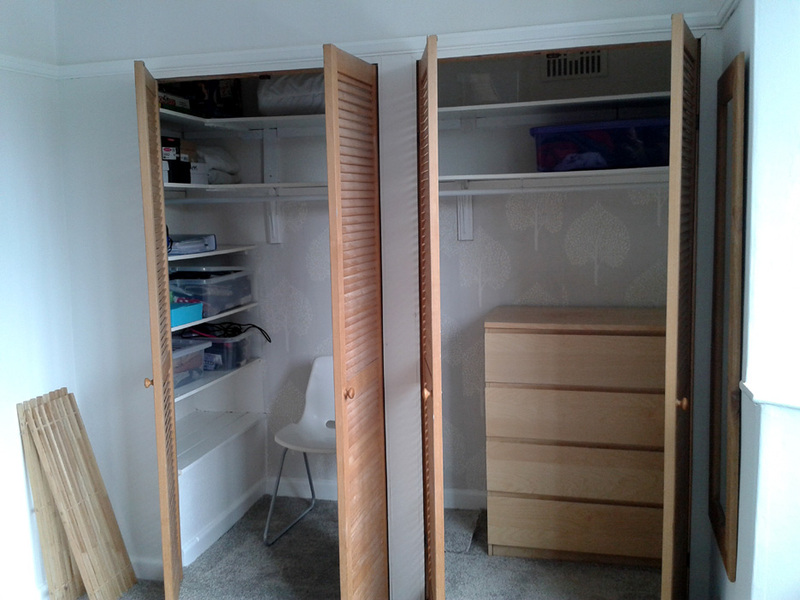 The bedroom cupboard needed sorting out and the shelving reinforced, plus the doors had to be shaved after having new carpets fitted. I was on hand to accept multiple furniture deliveries . 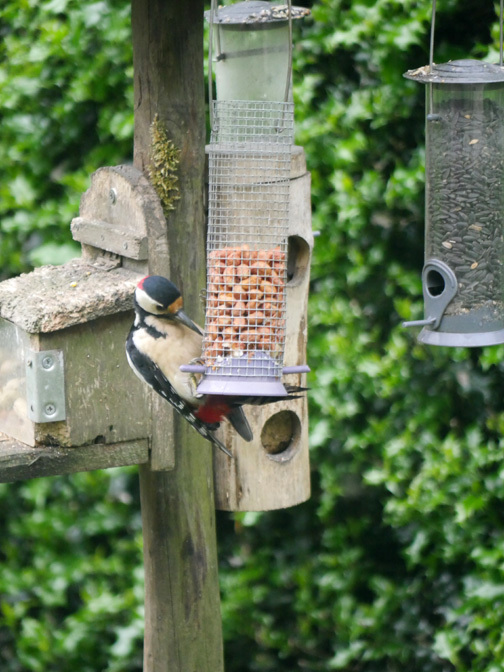 . . sorry about the blurred photo but it did look good for real. 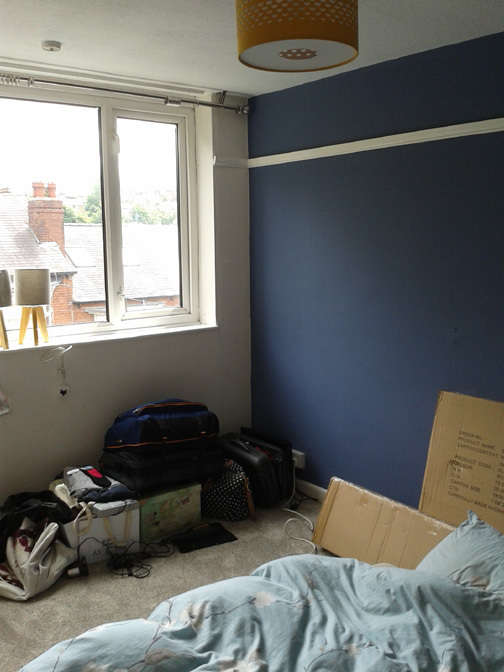 Curtain rails and the light done (boxes from our loft in Loweswater). 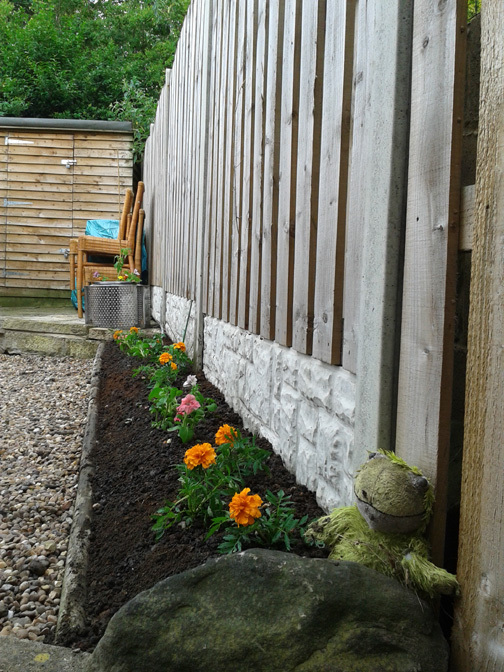 Kermit the frog helped out in the garden on the last morning. 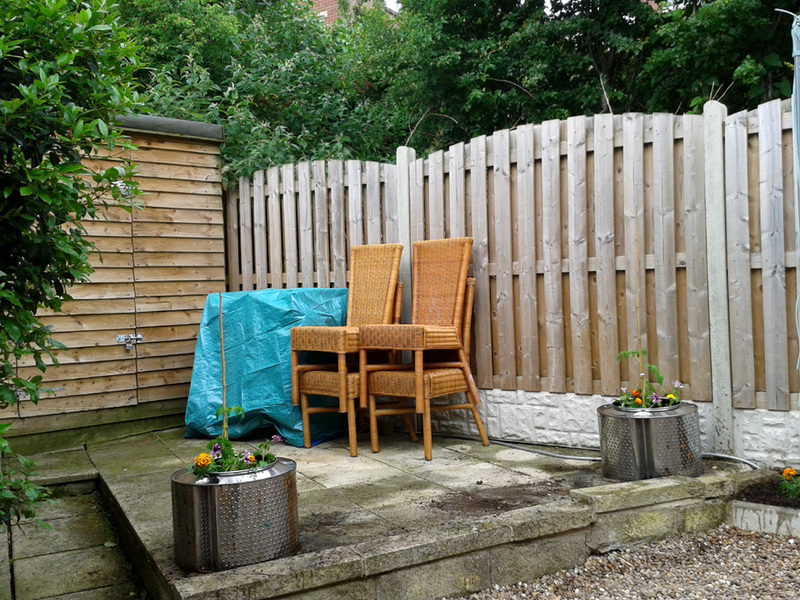 Two Loweswater tomato plants are the centrepiece of her recycled planters. 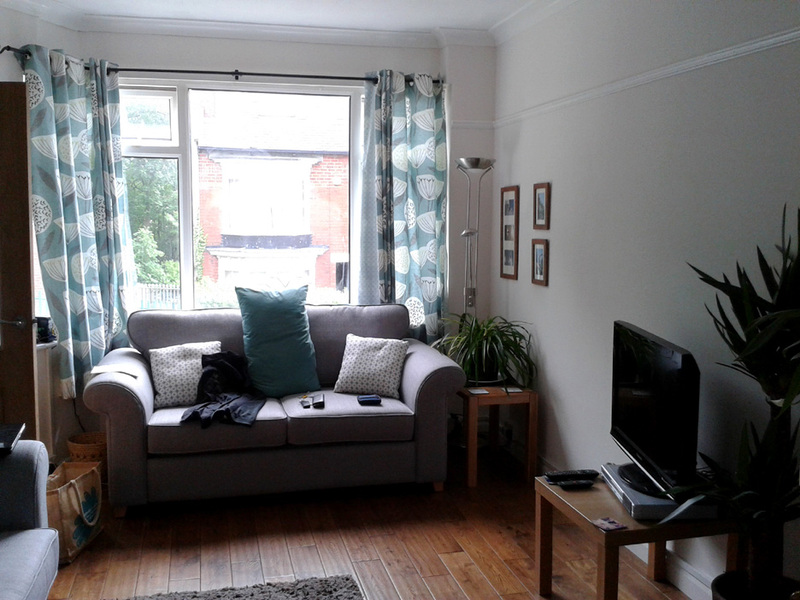 Pictures and mirrors hung, fixed the TV aerial wiring (my fault) and some of the other odds and ends tidied up for now. It has been a very busy but sociable weekend with my youngest daughter. So nice to be abe to help her move into her new home. 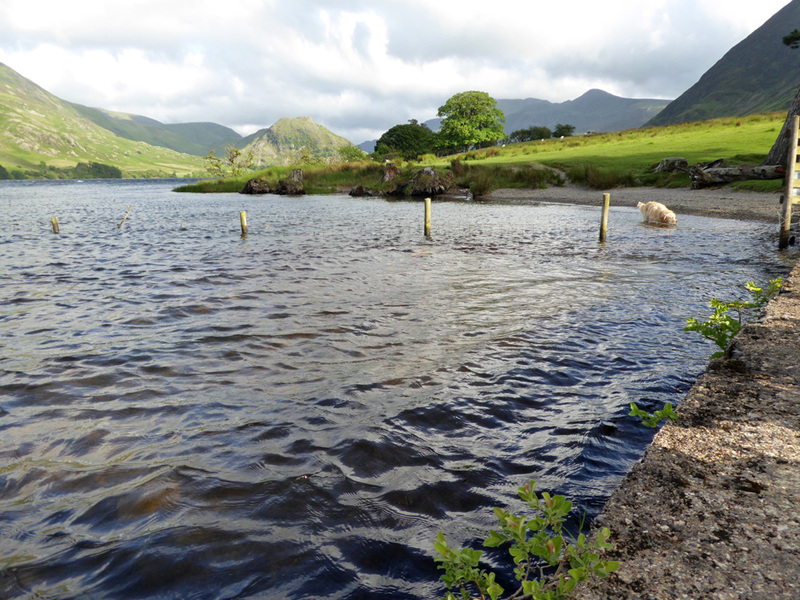 A few extras now from these last few days here in Loweswater . 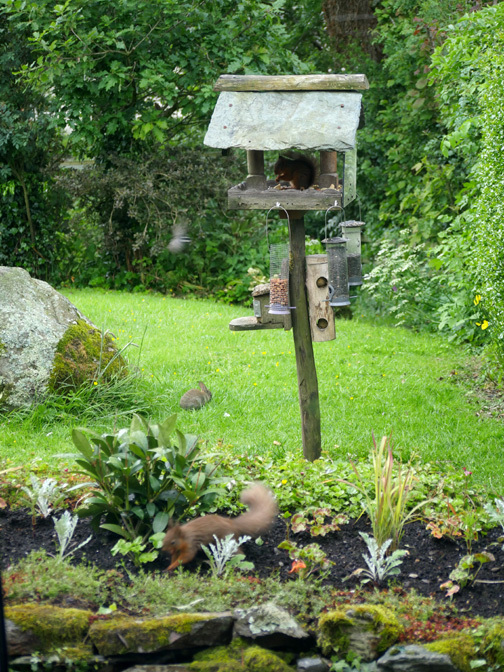 . .
Our lovely red squirrel seems to be making regular visits. 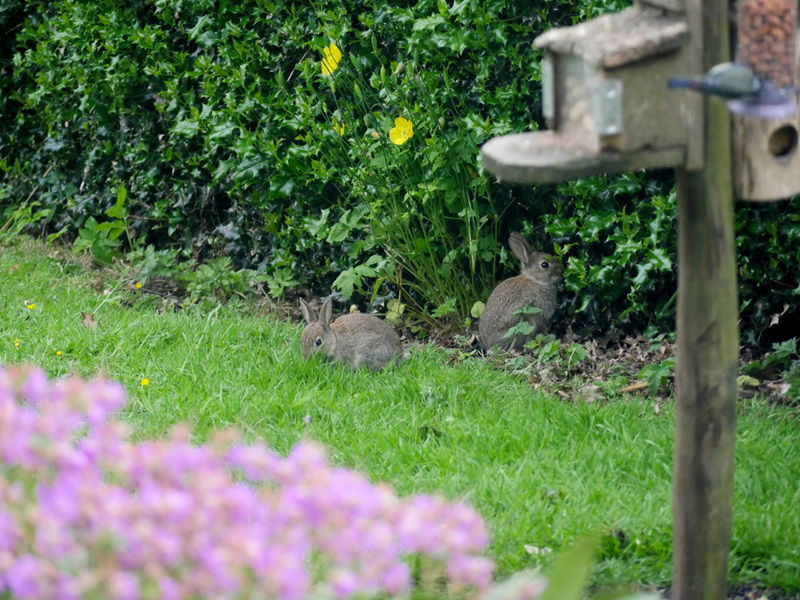 but sadly their appearance in our garden has led to the loss of many young flowers and vegetables from our garden beds. 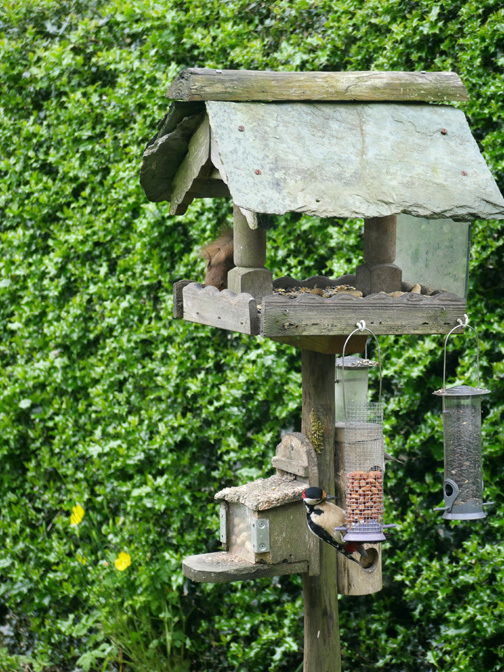 Two visitors to our bird table . . . 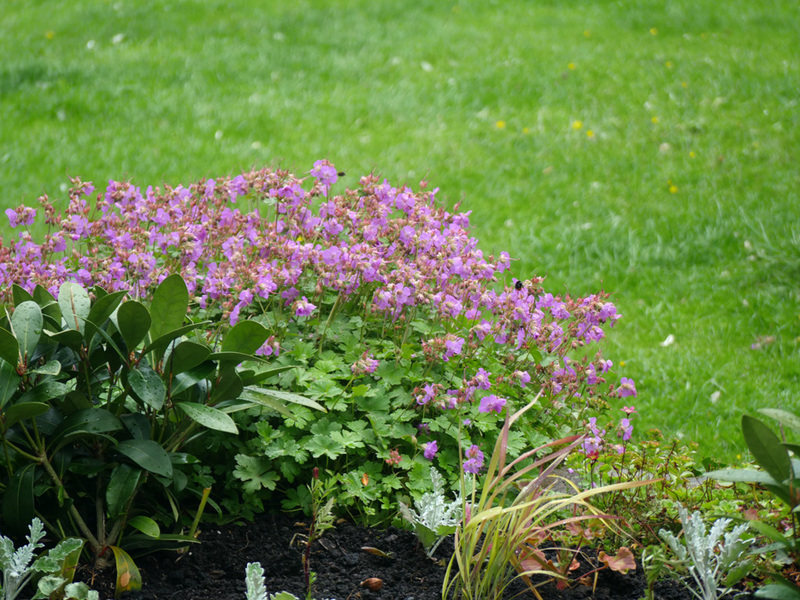 The bees are enjoying the geranium flowers. 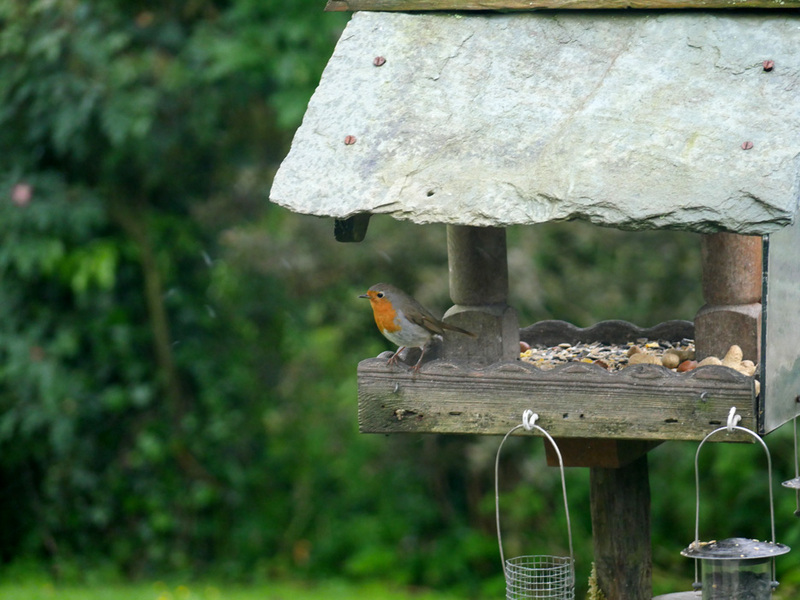 One of our robins watching me out of the corner of his eye. 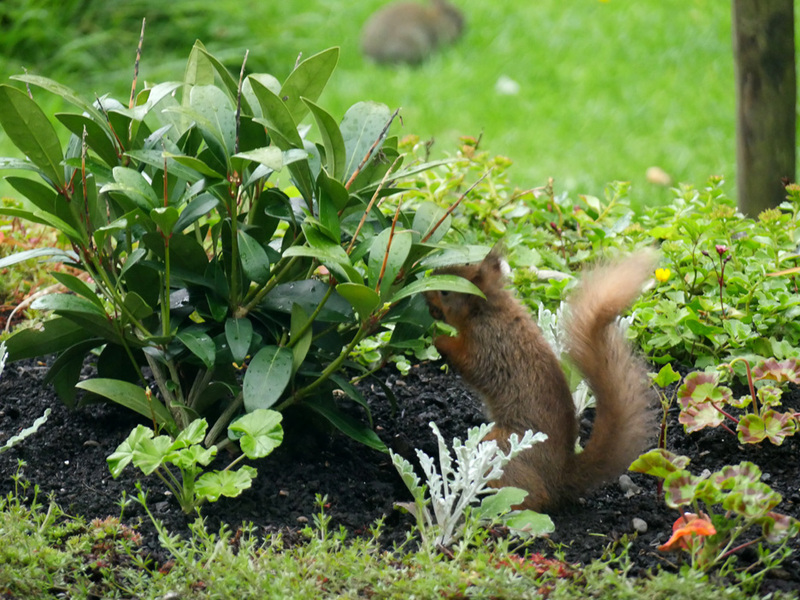 Our squirrel is taking advantage of the freshly turned soil to bury one of the hazel nuts. 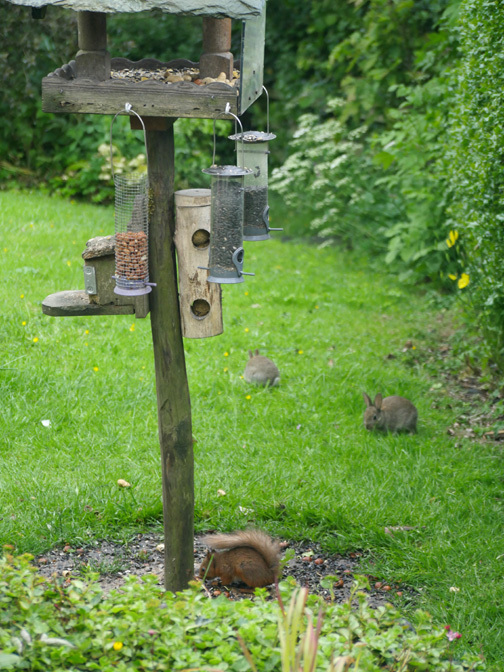 Two bunnies and a squirrel . . .
. . . but hang on there's two squirrels ! 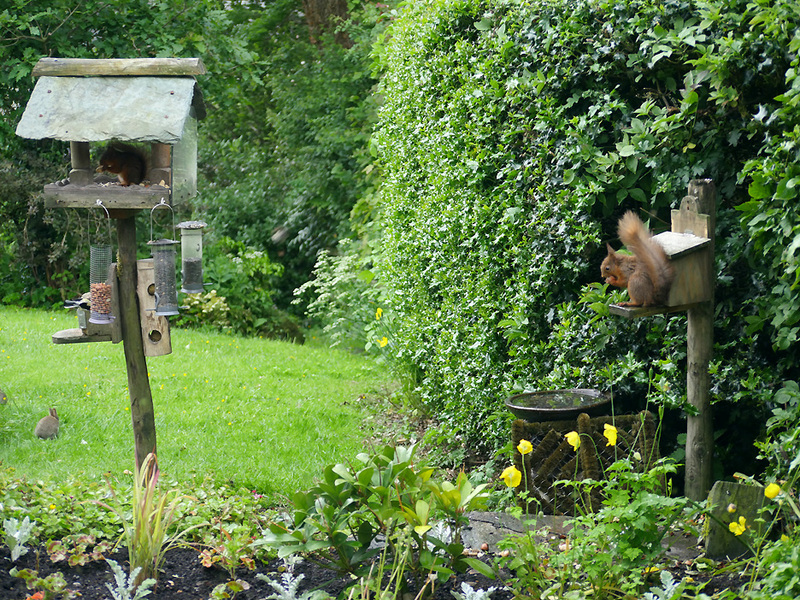 I thought we had two different red visitors but it is the first time for a while that we've seen them both together. 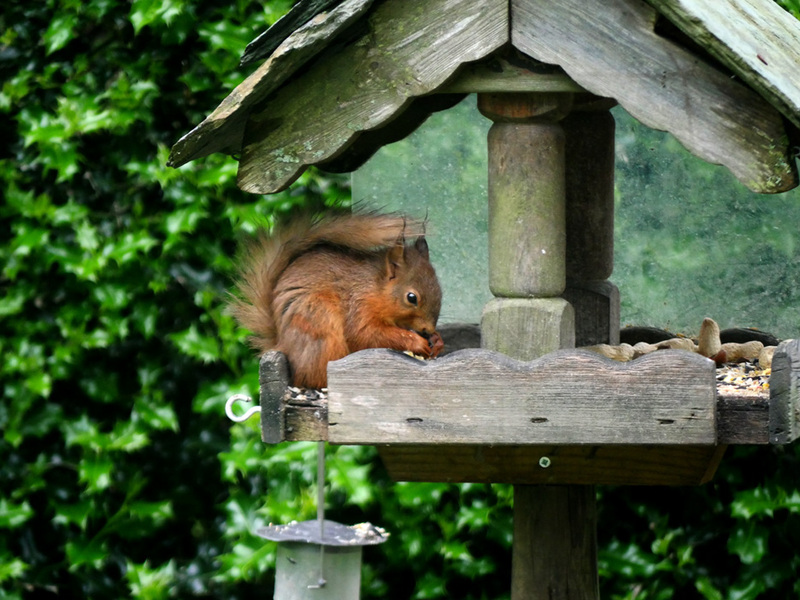 It's been a busy and rewarding look out of our sitting room window today. This site best viewed with . 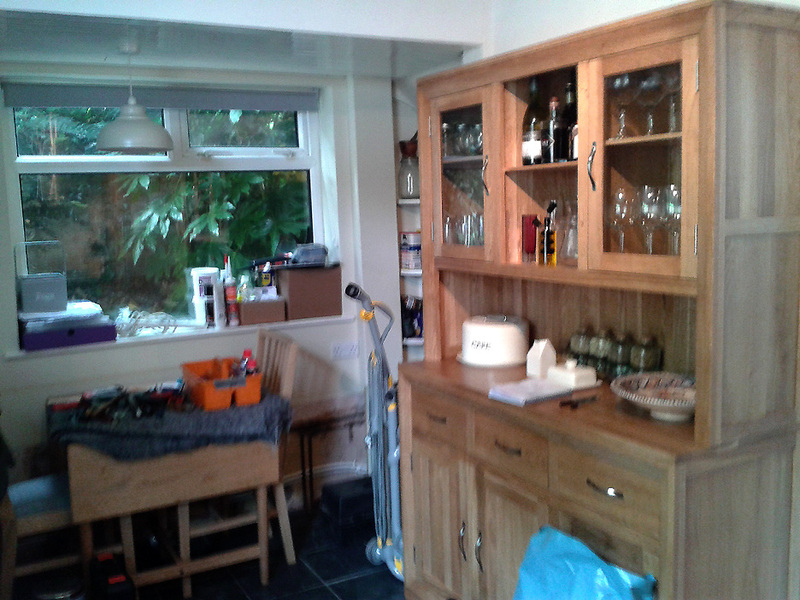 . . a box of tools and a local DIY supermarket close at hand. A previous time here - 19th March 2017 - Padley Gorge, Grindleford near Sheffield.